CWs for wastewater treatment can be classified according to the life forms of the dominating vascular plants and water flow regime. Figure 6 Classification of CWs for wastewater treatment based on the life-forms of the dominating vascular plants and water flow regime. The plant types highlighted in the large oval group indicates that all kind of vegetation types can appear in complex wetland systems for the treatment of diffuse fluxes from adjacent fields. The small oval highlights the most frequent type of CWs used for the treatment of diffuse agricultural pollution. Adapted from Vymazal J (2001) Types of constructed wetlands for wastewater treatment: Their potential for nutrient removal. In: Vymazal J (ed.) Transformations of Nutrients in Natural and Constructed Wetlands, pp. 1-94. Leiden, The Netherlands: Backhuys Publishers. of these wetlands in the catchment is a key question. Only those located downhill and next to critical source areas or in the riparian zone can provide a significantly efficient nutrient retention. It is mostly FWS CWs that have been used in watershed management, because of their significantly lower construction costs and material requirements. The FWS CWs also have structural and functional attributes that can even enhance the quality of the landscape. Restored and enhanced wetlands can provide compensa tion credits for the loss of wetland functions caused by human development activities. One of the best examples of the implementation of FWS CWs for controlling agricultural non point pollution is the Hovi CW in southern Finland (Table 3; Figure 7). This CW has an optimal structure from the point of view of hydrology, water quality improvement, and also biodiversity and landscape scenery issues. Adapted from Koskiaho J, Ekholm P, Raty M, Riihimaki J, and Puustinen M (2003) Retaining agricultural nutrients in constructed wetlands Experiences under boreal conditions. Ecological Engineering 20(1): 89 103.
established in 1998. Main technical parameters: waterlogged area at high flow (W) - 0.6 ha, catchment area (C) - 12.0 ha, W/C ratio -5.0%, wetland volume at high flow - 4000 m3, 100% arable land in the catchment area, mean slope of the catchment area - 2.8%, substrate soil - heavy clay with a low water permeability (3.0 x 10 7 1.5 x 10 15ms 1). Adapted from Koskiaho J, Ekholm P, Raty M, Riihimaki J, and Puustinen M (2003) Retaining agricultural nutrients in constructed wetlands - Experiences under boreal conditions. Ecological Engineering 20(1): 89-103.
and W/C ratio has been noted in several recent stu dies. Figure 8 shows the significant correlation between the W/C ratio and N and P retention in FWS CWs in agricultural catchments. This depen dence is demonstrated by results from 12 CWs in Finland and the USA. 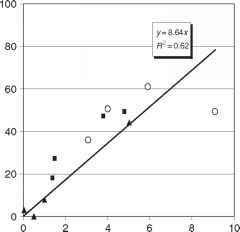 (>20%) load reductions are desired, the W/C ratio should be more than 2%. In the case of runoff water treatment, dimensioning should be based on the input water volumes of the highest annual runoff events, because the high water periods account for a great deal of annual loading. 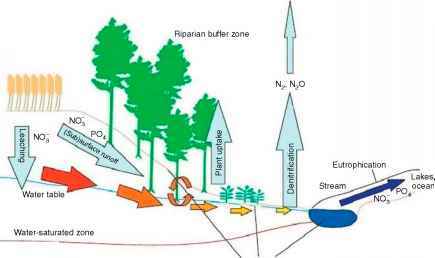 Another example of CWs for non point pollution control comes from the Vanda subcatchment of the Porijogi River (Figure 5). The vegetated sedimentation plateau, horizontal subsurface flow (HSF) CW, as well as a meandering stream stretching downstream of the CW would decrease the N and P loading in the stream (Figure 9). Several estimations of the efficiency of riparian buffer zones and riparian wetlands at large scale have been performed in the Mississippi River catch ment. Mitsch et al. estimated in 2001 the potential reduction of N to be about 300 000-800 000 metric tons a year when 21 000-53 000 km2 of new riparian buffers and restored wetlands could be established in the entire Mississippi River Basin (0.7-1.8% of the basin). Another 300 000-800 000 metric tons of N would be removed by the restoration of 78 000200 000 km2 of bottomland hardwood forests (2.7-6.6% of the basin).